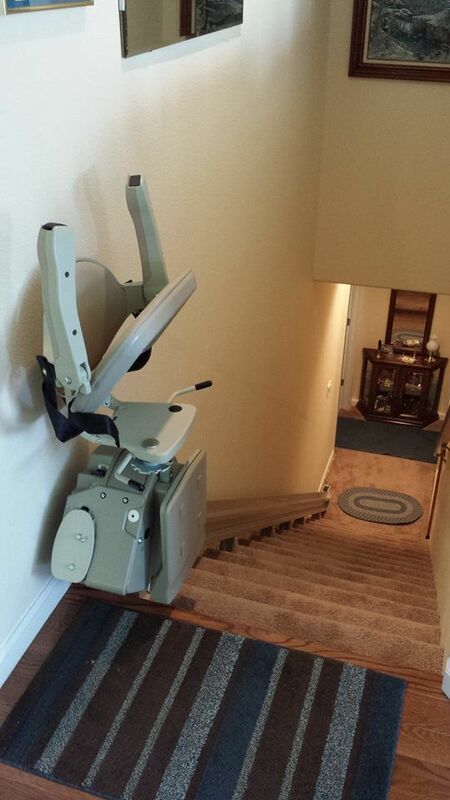 This American made straight stairlift in Cheyenne, Wy was installed in about 3 hours in only 3 days from the time of order. This lift fits within 2 inches of the wall and folds up tight to the wall. This staircase is 17 steps and measured over 18 feet from top tread down to the floor. The standard rail is only 16 feet long, but we can install a stairlift up to 24 feet long. We couldn't have had a better experience than we had with you folks. We were especially appreciative of this because the week before we had had a representative from another stair chair company visit us. He was very arrogant and disrespectful, more interested in telling us why we needed his product than in accommodating our needs with his product. Our contact was with Michael French. He answered all our questions, met all our needs, and was a pleasure to meet and interact with. The stair chair he installed and the grab bars are working great. Our only regret is that you folks aren't a little closer so we could patronize you more often as needs arise. Praise God for a company like yours. Thank you for everything.